Second reserve champion stallion at the KWPN stallion licensing 2019 Lance is a very modern, high set and interesting young stallion who was number three in the premium ring at the KWPN stallion licensing 2019. He is a dressage talent with three functional and supple gaits where the trot and the canter both are uphill and powerful. His pedigree is also something very modern and interesting with a lot of good results. The sire, Glamourdale, was in 2014 winner of the performance test in Ermelo with a total score of 85,5 points. In 2016, he was placed as number four in the Pavo-Cup final and in 2018, he was the world champion for seven-year-old dressage horses in Ermelo under the talented rider Charlotte Fry. The dam, Heliana V.O.D. is a elite mare and in 2015, she was the best mare in KWPN. 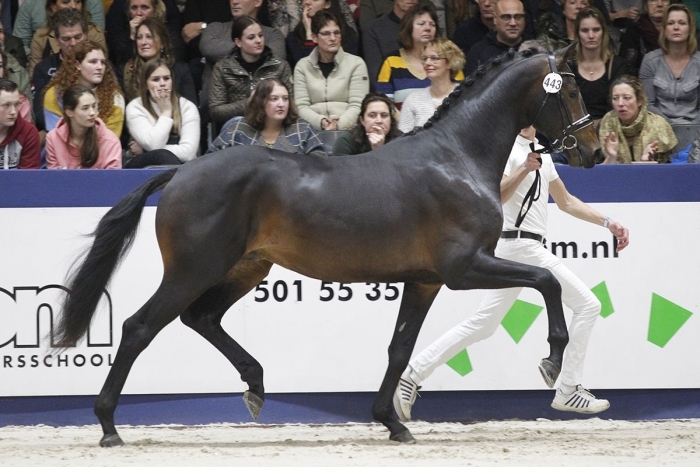 The grandsire is the dutch Davino V.O.D., who finish his performance test in 2011 where he was judged with 8,5 for walk, trot, canter and 9 for his rideability. The dam to Davino is also the dam to the Grand Prix horse Reveller and the successful breeding stallion UB40, who is the sire of Apache. In third generation you find the Grand Prix stallion Jazz, who was in the lead of the WBFSH ranking of the most successful dressage breeding stallion for four years. Lance is approved for DW and KWPN. Lance is not a carrier of WFFS.